Dr. Ronald Meinardus bade farewell at the launch of his book. 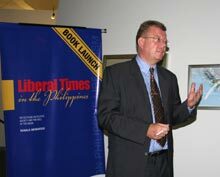 The Friedrich Naumann Foundation (FNF) bade farewell to its resident representative of four years, Dr. Ronald Meinardus, as it launched his book, Liberal Times in the Philippines: Reflections on Politics, Society and the Role of Media on 26 September 2006 at the Yuchengco Museum in Makati City. 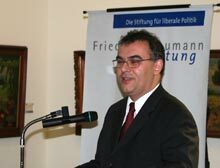 Liberal Times in the Philippines is a compilation of Dr. Meinardus’ newspaper columns, which represent the focal point of his work at FNF: strengthening organized liberalism in the country. Dr. Meinardus is now assigned as the Foundation’s regional director of the Middle East. Newsbreak magazine editor in chief, Maritess Vitug praised Dr. Meinardus’ book for its wide perspective. “His essays are never parochial. The commentaries thoughtfully take us through the nuances of being a liberal, especially in a country like the Philippines,” she said. “The single most important message of the liberal Foundation in the Philippines during the past years is this: democratic, platform-based, and publicly-accountable political parties are crucial in a democracy,” she added. Journalist Manuel “Manolo” Quezon III talked about Dr. Meinardus as a communicator. “He believes that one of the great benefits for our country politically would be to get people who are voiceless and unable to participate in political dialogue to speak up,” he said. “The quickest, cheapest and most effective way is to throw out their views online. This is what blogging does,” he added. Through the Foundation’s sponsored blogging workshops, “people are now able to talk, to be involved, to speak out and challenge the existing ideas. This, I think, is the great contribution Dr. Meinardus has made,” Quezon concluded. FNF Regional Director Hubertus von Welck thanked Dr. Meinardus for his drive to use new communication tools in the Foundation. “Dr. Meinardus offered not only to train, teach and enhance the communication skills of our liberal friends in the Philippines and our partners in CALD, [but he also] pushed us, his colleagues, to get acquainted with the new communication tools to improve our work and outreach,” said Mr. von Welck. Mr. Herzog thanked Dr. Meinardus for the work he had done and for the strong team he leaves behind. “You have set a new standard in the Foundation, especially in the use of information technology for civic education, and I will do my best to keep up the standards you have set,” Herzog said. “I am an economist, not a journalist, and this will necessarily shape my contribution. Our basic focus remains the same: to promote liberal ideas and concepts and to help strengthen the liberal family,” he added. “But within this context, two topics are especially important to me. One is the issue of economic freedom, and the other is the quality of political institutions. Two areas where I believe an organization like the Friedrich Naumann Foundation can make a meaningful contribution," he concluded. Liberal Times in the Philippines: Reflections on Politics, Society and the Role of Media is available in major bookstores.